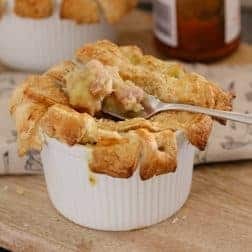 Creamy Chicken, Leek & Bacon Pies topped with crispy puff pastry are easy to make and taste delicious... a classic winter dinner. Printable conventional and Thermomix recipes included. Preheat oven to 200 degrees celsius (fan-forced). Lightly grease 5 large ramekins and set aside. Brush over the whisked egg and sprinkle with sesame seeds. If the mixture is too runny for your liking when it's finished cooking in the frying pan, dissolve 2 tbs cornflour in a little water and mix through.